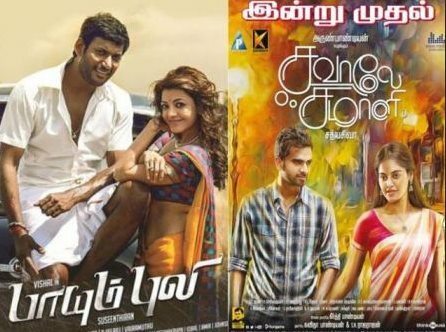 Tamil movies which were slated for September 4th release have hit the screes as per schedule. Earlier, there were huge speculations regarding the flick's release as the Producers Council made an announcement that no films would be released on the particular day to express their objection regarding the issues related to 'Paayum Puli' release. All these issues happened when problems got triggered in association with the release of ‘Paayum Puli’ in Rohini theater, Chengalpattu. But now, Vishal has directly involved in this issue, and he has made it clear that the movie will hit the theaters on time. He also made it clear that there is no point in delaying the release of a particular movie just for the sake of one theater owner or distributor. asked Vishal through his official social media page. Now, since the producer council obliged to the request of the producers, the movies which were slated for release today have hit the screens. The confirmation made by Vishal in association with ‘Paayum Puli’ release has set a soothing wave of happiness in the minds of Vishal fans. They are now eagerly waiting to see their favorite star gracing the big screen with style. Suseenthiran has directed ‘Paayum Puli’. The film stars Kajal Agarwal in the role of female lead, while Samuthirakani is also doing a pivotal role. ‘Savaale Samaali’ is directed by Sathyasiva. Bindu Madhavi has done the role of heroine in this movie. The supporting star cast includes, Nassar, M S Bhaskar, Aishwarya, Karunas and Jagan. The film is expected to be a commercial entertainer, and it will have all necessary elements to meet the needs of mass audiences. S. Thanigaivel, produced the 'Pokkiri Mannan' starring dance choreographer Sridhar and newcomer Spoorthi in lead roles. Vishal's 'Paayum Puli', Ashok Selvan's 'Savaale Samaali', 'Pokkiri Mannan' have hit the screens and the respective film crews are relieved about the release.